Earlier today we reported on more woes for the struggling Square Enix, with Dragon Quest X posting poor launch week sales in Japan. The overall Media Create results for last week do also tell a few other tales, including a modest improvement for Wii U and some good results for a famous green brother. In terms of the software charts, Luigi's Mansion: Dark Moon has shown promising momentum to comfortably retain the top place, while Animal Crossing: New Leaf is back up to third place and looks to be just one week away from passing three million sales in the region. In terms of the new Wii U titles, as we've already reported Dragon Quest X only sold a modest 33,302 units — perhaps not helped by the fact it was also released on Wii only last year — while Game & Wario has also failed to capture the public imagination in a big way, scraping into the top 10 with just 22,491 units sold. The top 20 is below, with lifetime sales in parenthesis. In terms of hardware, the 3DS is once again ruling the roost, with 3DS LL on top and combined SKU sales for both models giving the handheld a dominant advantage. We've also seen a small victory for the Wii U with sales doubling, helping Nintendo's console sneak past the Playstation 3; last week's sales are in parenthesis. While the bump in sales for Wii U is a bonus, we doubt it'll prompt an office party at Nintendo HQ; neither of the system's new titles lit up the charts. It's still improvement, and the 3DS continues to happily fly off the shelves in the Land of the Rising Sun. Well I'm glad to hear the Wii U is doing better! I hope it'll continue to do well. It's a great console and I really hope it improves like the 3DS has. Yeah better sales all around.Nintendo Just needs to do what they are doing with the 3ds. Release 1 good game a month at least and it will be fine. It doesn't need a Price cut that's just a permanent patch for a temporary solution. @Relylp I agree completely. One big game a month with smaller games littered in the month would do wonders for the WIi U. It's nice that the Wii U (and the PS Vita) is doing well this week. @Relylp Yep, I really don't think a price cut is what it needs. After all, the games end up being the most expensive part of the system. "Hurp derp people aren't interested in Wii U." Wrong. At least things are looking up for the Wii U to an extent at least. The only way is up! Still some good competition between the 3DS & Vita though, which hopefully means lots more awesome games for both systems! The Wii U does better with more games? Huh, go figure. Like I've been saying for quite some time, once the hard-hitting titles start steadily coming in, sales will go up, and up. Quality games=hardware sales. Its that simple really. What games are on Vita that has it doing so well? Hopefully now Nintendo will realise that Animal Crossing is one of their top tier franchises. I've waited far too long for this game! Keep it up man in green! Does this mean we can cease with the "Wii U & Nintendo are doomed" talk? I hope this momentum continues in Japan, and some builds here. Until Wii U attach rate picks up, all we're going to read about is "(fill in X game here) NOT coming to Wii U." Well, that's very good news indeed. I don't think the Wii U will have too much trouble playing a bit of 'catch up'. A month later is about the time where it could start doing good. Wait... [Wii U] Game & Wario (Nintendo, 03/28/13) – 22,491 (New). Game & Wario's released over there? Good to see you WiiU top the PS3. Ild be worried about it being outsold by the Vita but since Japan is so portable friendly that makes sense. That and the pent up Vita demand waiting for a price cut. Whoa Luigis mansion is doing great! And animal crossing simply refuses to leave the top 10. It will be there for quite some time. never worry about WIIU,trust Nintendo ! Those people are getting the basic set. I pity them. More sales for the Wii U is a good thing. The more people that own the system, the more that will go out and get the big titles. It doesn't need a price cut and shouldn't get one. They need to make sure they have a schedule full of steady releases. Games sell a console and Nintendo needs to be ready when the next Xbox and Sony consoles hit the ground running this fall. Good news for the Wii U, and also for Animal Crossing: New Leaf! I'm a little disappointed Game & Wario didn't share the same good fortunes. 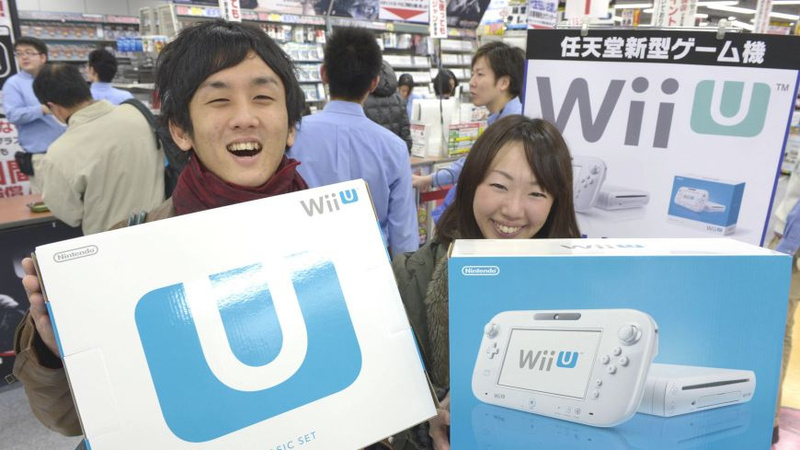 woo Wii U is picking up the sales! That person in the pic must be tiny or holding a Wii U display box, coz it looks huge in comparison! UK sales went up last week, Not as easy to track but estimates are an increase of around 2.25% from the week before. May not be massive, but seems WiiU sales are steadily increasing a little more as each week goes by latley. It's already been said but I'll say it again too All the Wii U really needs is quality software released regularly and better advertisment and the thing will pick up some momentum. In other news, AC:NL just refuses to leave the top charts O_o. How many people live in Japan? With weekly figures like that, I suppose by now every Japanese citizen owns a 3DS or maybe two! Wii U is the highest selling non-handheld. Hopefully it stays that way for a long long time. When the Wii U starts climbing in sales in North America then I'll be pleased. The system still needs better games. @Blizzaga It's just what the Japanese call the 3DS XL. LOL @ PSP selling phenomenally better than Xbox 360 in Japan xD Those people have good taste! Yup, getting better. Nintendo please make it the best! It's amazing how a couple of new releases help sales. But I think thats only for 2 days worth of sales, so it might pick up a bit more next week? 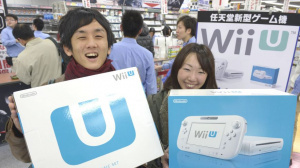 The Wii U actually sold more than the PS3... Did Nintendo launched a brand new ad in Japan or something?? Im pretty sure it's because of Monster Hunter that the Wii U console sales are increasing well at least in my country that is. Around 10+ of my friends got the Wii U last month just for MH3U. I know that I was one of the person who got the Wii U just so I could play Monster Hunter 3 Ultimate on online multiplayer. I have the 3DS version as well on MH3U. Worth it! @Rei7 You mean the game that sold 11,573 copies this week?